Why Do I Get Shin Splints When Running? Shin splints are an overuse injury of the leg. They are caused by the functioning of the foot during walking or running. In fact, the condition is aggravated and often caused by pronation (flattening of the arch) or supination (increasing of the arch) throughout gait. As the foot functions in this way, the muscles of the leg are aggravated and become increasingly painful and problematic. 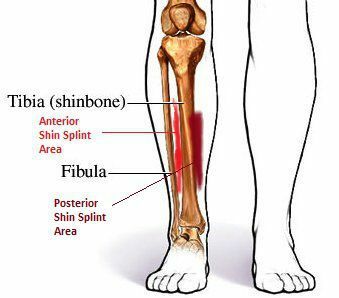 Posterior or medial shin splints are commonly inflammation of the muscle attachment to the shin bone (tibia) and hurts as from pressure to the muscle just inside the bone. Anterior or lateral shin splints are commonly inflammation to the tendon (posterior peroneal tendon) and adjacent tissues in the front of the outer lower leg. In either case, the pain can present during a run, immediately following the run or sometimes the next day. The exact cause of shin splints are not known, but usually it is related to rapid increase in running, jumping, dancing or sprinting (or sometimes walking fast), changes in shoegear, or pronation (flattening of the foot). Some secondary causes may be balance problems (leaning to one side during a run), poor training technique (progressing too fast, poor running technique or surfaces), leg length problems or even injury.